There's a bigger problem with young boys wearing makeup. "We should be celebrating boys wearing makeup - on one condition." Last week, Reuben De Maid appeared on The Ellen DeGeneres Show. Like many kids who appear on the chat show, the 12-year-old from Wales has a serious talent – his voice. He’s due to star in upcoming show Little Big Shot and his performance was truly astounding. Todays the day i appear on the ellen show in AMERICA???????? But De Maid also has another creative passion: makeup. He appeared on the show (and other morning shows in the UK since) wearing a full face of “Instagram makeup”, including contouring and a cut crease to rival a professional’s. His love of makeup, which started when he was eight years old, hasn’t come without its challenges. In fact, it’s even had him beaten up. “In my drama group, I used to get hit, punched and kicked,” he told DeGeneres. Remember!! !⚫️⚫️⚫️ ITV GOOD MORNING BRITAIN AT 7:50 tommorow morning!!???????????? In the end, De Maid begged his mum to let him change schools, which she did. “Good for you for not stopping being who you are. That’s really tough,” Degeneres told him, before gifting him a huge package of makeup and his own makeup vanity. She’s absolutely right. De Maid is part of a growing number of boys, both young and older, who are using makeup as a form of self expression and exploring their identity. 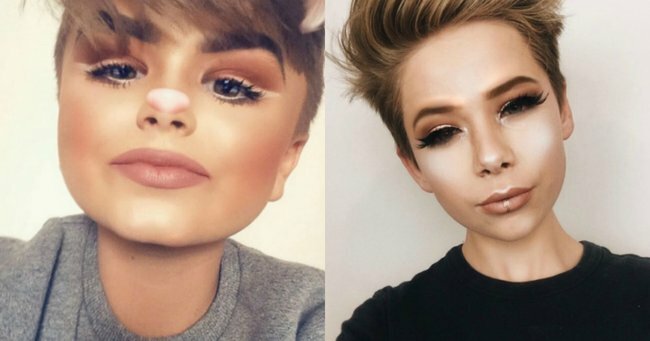 Jake Warden is 15 years old and already has over one million followers on Instagram and 375,000 YouTube subscribers thanks to his makeup tutorials. While there are comments questioning why as a boy he is even wearing makeup (welcome to the internet) most express envy and appreciation for his incredible makeup skills. It’s so important for everyone to have the outlet, the confidence and the freedom to play with and wear makeup, as both De Maid and Warden clearly do. But after nodding along with Ellen during the interview (and envying De Maid’s razor sharp eyeliner) another thought entered my mind. Would we be so encouraging and supportive if it was a 12-year-old girl talking about her love for makeup? And what if she was wearing a full made up face on national TV? The reaction would – and has – been very different. In 2015 Kim Kardashian came under fire for revealing her then two year-old daughter North loved playing with her makeup. In 2016, Teen Mom star Farrah Abraham faced similar criticism for sharing a picture of her eight year-old daughter Sophia for wearing makeup for a photo shoot. And last year, model Katie Price’s daughter Princess hit back at critics who slammed her for wearing lipstick and mascara. “By the way, I want to do my make-up, not my mum. I do. And anyway, it’s none of your beeswax!” she responded. Much of the criticism of beauty pageants (among other issues) is the clothing and makeup that leads to the sexualisation of young girls competing. I’m yet to hear the same criticism leveled at boys wearing makeup. And yes, I’m aware that males loving makeup have an entirely different field of challenges and stereotypes to overcome. Obviously, these girls are younger than De Maid, not even in their teens. And there’s a difference between a toddler haphazardly applying lipstick all over her face (and any other surface) and a child sitting down to purposefully apply a full face of makeup. But even when girls do enter adolescence, there’s a long, tricky grey period where everyone has a different idea of what makeup they can and can’t, should or shouldn’t wear, if any. It raises an important question: what is age appropriate when it comes to makeup? And with the explosion of beauty videos on sites like Instagram and YouTube making makeup more accessible – and fun – than ever, do we need to rethink our approach to children and lipstick? A 2014 study conducted by Escentual.com found that the average age girls in the UK were starting to wear makeup was 11, three years younger than it was ten years ago. The study also found that 89 per cent of women thought young girls should wait until they’re 14 years old to use foundation, 13-and-a-half to use eye makeup and 12-and-a-half to use lip gloss. “Women are mostly concerned that these pre-teen girls might develop an unhealthy obsession with their appearance,” Escentual’s Emma Leslie told Marie Claire. Obviously, it’s up to parents to decide what they’re comfortable with their children doing. Every situation is different. There is no blanket rule that can determine what is and what isn’t appropriate, which is exactly why parents have been having this argument for decades. Yet it seems than more than ever before, more young people are turning to makeup not necessarily to make themselves look older, but as a form of creativity and experimentation. And if we’re applauding boys using makeup to express their identity (which we should), then we need to give girls the safe space to do the same. So just as we might encourage our children to paint or draw or play music, should we be giving makeup the same treatment? Should we do away completely with the idea that there’s a “right” age to start?